Many of the best experiences in life are totally unplanned. I remember one of my last days in high school when the entire grade 12 class (all boys) hopped over the fence of the neighboring girls’ boarding school in the middle of the night and went streaking. I made a wrong turn and — with nothing but running shoes on — stumbled upon a legion of young girls staring out of their dorm windows. Totally unplanned, 100 percent memorable. 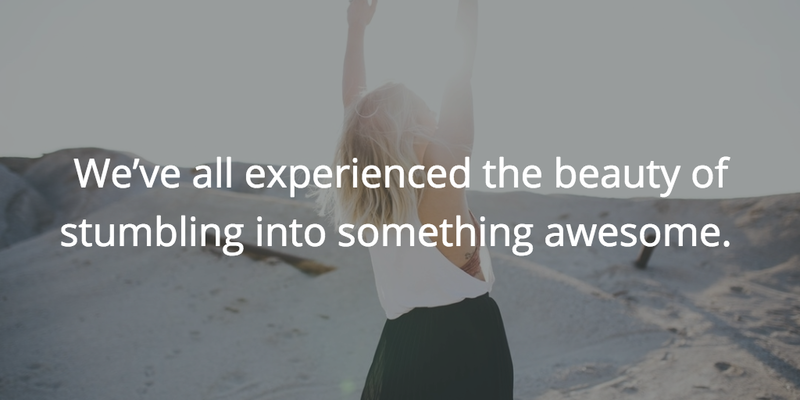 Whether it’s random high school moments, a spontaneous weekend adventure or a serendipitous encounter, we’ve all experienced the beauty of stumbling into something awesome. I work for an incredible company, with teammates scattered around the globe. But a few weeks ago, this all changed. I’m part of a three-person team, and recently we got the chance to build a new online product. But, before we could begin, we first needed to complete a five-day design sprint to validate the idea. The other guys on my team live in Europe (I’m just outside Toronto, Canada) so I woke up early for those five days to spend as much time as possible together. It was a stellar experience to have Zoom (video call) running for the entire day as we brainstormed, built prototypes and gathered user feedback. I love starting work at 5 am! The key part of this new rhythm is the middle section. From 11 am to 3 pm, I’m free to do whatever I want! During this break, I typically hang out with my wife and kids until 1 pm, put my two older boys down for their nap, then head to the gym for an hour. I’m back by around 2:30 pm, at which time I grab a quick shower and meal then jump back in to work. It’s so trippy to take a four-hour mid-day break but still smash out a full day of work. The other added benefit is how this schedule affects my evenings. I need to be sleeping by about 9:30 pm to feel fresh in the morning. Generally, I’m not doing anything super valuable late at night, so I find that most of my time awake is spent on activities that mean a lot to me (e.g. hanging out with my family & friends, fitness, reading, work). Of course, I will stay up late if we’re we have people over or if there’s something I want to watch live, but I’m usually in bed a little after 9 pm. I’m aware that most people don’t enjoy the same freedoms as I do at my company— the choice to work where and when I want. However, my new-found love for 4:30 am wake-ups isn’t just about when I start my day. As I reflect on why this new rhythm makes me feel so great, I realize that they’re something deeper, something beneath the long mid-day break and the pride of waking up early. It’s about the ability to choose. At a roulette table with one wheel. At a roulette table with two wheels. All the wheels were identical. So, which table did people prefer? The table with two wheels. Why? Because on that table, they could pick the wheel they wanted to play on, and that allowed them to feel more in control of their bet. 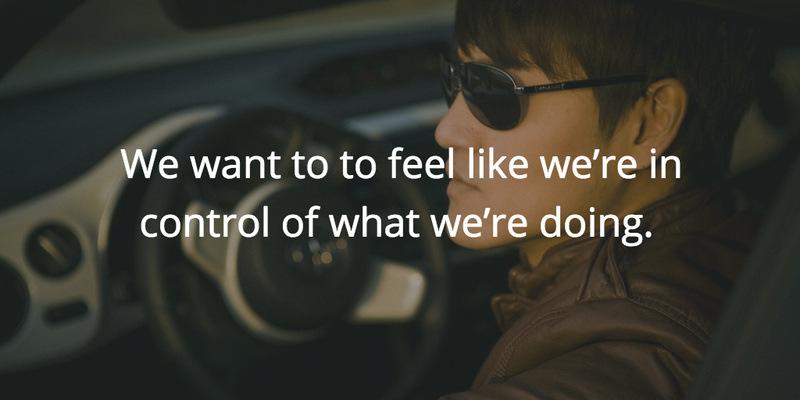 This experiment illustrates what many people really want— to feel like they’re in control of what they’re doing. I’m incredibly grateful to enjoy this privilege. Great piece Roy, thanks for sharing! If I had the choice, I’d definitely opt in for a super early start of the work day as well. I don’t think I would do the break in the middle though, but rather wrap up my day super early where I can still have a full day ahead of me. I think it’s also important to realise that even for those of us who have an inflexible 9-5 office job, there’s still a way around making the most of our morning routine. For example, I can easily wake up at 7:30 AM and make it to work…but I choose to wake up at 6 AM instead, because it gives me time to reflect about the day ahead, exercise and enjoy a hearty breakfast. Love that, Reej! Such a great point! Thank you so much for reading Roy’s post! I am working for an employer instead of myself. I just want to get back to where I work for myself. I know at the beginning, I would be happy to work any hours, then as time progresses; get a more set schedule. And yes, the earlier the better. Nice article Roy. The power of choice, is an interesting one. I think this depends on the type of person…it reminds me of zuckerberg and jobs not wanting to choose what to where each day. There are only so many decisions you can make in a day, some of them aren’t worth your energy. HOWEVER. The choice to wake up early is very important, and can be your first choice of the day. Good for you Roy! Next you’ll find sleeping in on Saturday means waking up at 7:30. But a small price to pay for the freedom and flexibility. All the best as this becomes habit for you! Hehe — this is so true, Brad! 6:30am wake ups are already sleep ins! Inspired by the idea of waking up early and being productive right away :) However, I would suggest that you remove the first part of your article where you are essentially glorifying sexual harassment. How is it “awesome” to exhibit yourself in front of school girls (even if you were young at the time) without their consent? This did not add any value to the article and just causes you to lose credibility to readers. It is more than “odd”, it is illegal behaviour in many countries. What an incredible switch! It’s so wonderful that you’re able to really set your own schedule so that you do feel in control. It can be cumbersome working a 9-5 where your colleagues are expecting you to be at your desk every moment of the day. I feel like I can somewhat set my own schedule now, but it’s very much a panic (for them!) if someone calls my work phone and I’m not there. Your post is giving me hope that one day I’ll also be able to set my own schedule like that – what an amazing opportunity! And for the waking up at 5 am part, I do the same! I’ve found I’m at my most productive in the morning – it’s when I work on my blog, freelance opportunities, etc. I also loved and appreciated hearing about that sprint! It must have been a hectic time, and I really enjoyed getting a little glimpse into what that those 5 days looked like for you all. Thank you for all that you do! Buffer is an amazing community and tool, and it’s humbling to see how hard you all work to continue its momentum going. Happy Thursday, Roy! Hope it’s a great one. So great to hear that you’re also pursuing a schedule that works for you, Gabriella! 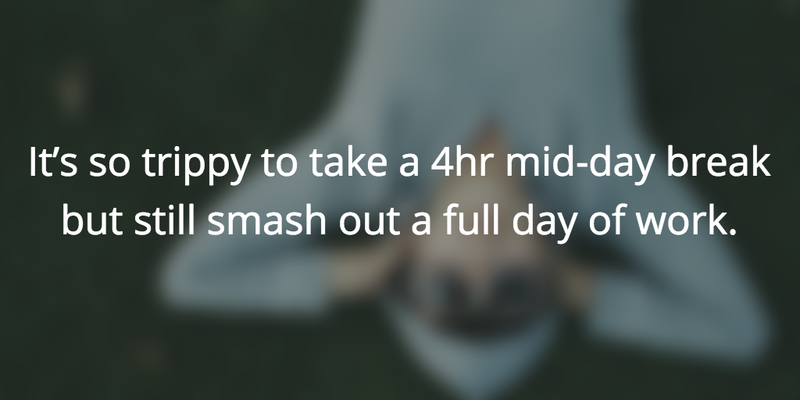 You have essentially learned the benefits of the daily schedule of many other countries– the midday/dinner break, NOT as it is known “siesta.,” in Latin American countries, and as well, many European countries. However, the key here is CHOICE. There is a natural/biology aspect to being a morning vs being a night person. Most of my life, I struggled with early am hrs., the worst was high school starting at 8 am. it didn’t matter (and still does not) how early I went to bed AND that was also difficult. Thankfully, college allowed for choosing later classes 10:00 to start. But work? 9-5 was so bad, I learned to take a 10-15 min nap (later called “power nap”) in the bathroom, until I had my own office, with a door. You are obviously a morning person. Not everyone is. ( I remember a supervisor who believed that rising early to be productive was moral– she grew up on a farm– I had to ask her, what about all the people who are needed for night jobs (ER. staff, police, etc.) In sum, I too love choice and making my own hrs. Thanks to modern technology and the changing work force, I have been able to keep my own hrs, instead of the foolish and inhuman 9-5 grind. My favorite part is the quiet for the writing and research work I am able to to during my best work times 10pm -2 am. and 11 am -1 pm., which allows interchange with others. So awesome to hear this. Yes, everyone is different, and it’s so important to figure out what works for you as an individual. Love that 10pm to 2am stretch — wow, we’re so different! I’m useless past 9pm! That’s an incredibly intriguing idea. I know a few working mothers who do this so they can get some work in before getting their kids off to school. Hurray for the power of CHOICE. I believe one of our incredible teammates at Buffer also does this so that she can be available for her kids once they wake up! The tiniest hint of choice makes so much difference to folks. It’s really incredible for employers to learn that allowing freedom like this keeps employees happy and productive and engaged. So true — massive benefits to the employees, which in the end means massive benefit for the employer!